E4TheFuture Can Energy Efficiency and Health Industries Bring Momentum Mainstream? Can Energy Efficiency and Health Industries Bring Momentum Mainstream? When E4TheFuture decided to explore the health co-benefits of energy efficiency in its November 2016 white paper Occupant Health Benefits of Residential Energy, we had a particular reason for doing so. Our initial focus was to document studies that could help inform cost-effectiveness screening—specifically, to help make the case that important health co-benefits of efficiency exist, and their value is not $0. We were excited to piggyback on a broader research effort undertaken by the US DOE. Its December report Home Rx: The Health Benefits of Home Performance includes a comprehensive, systematic review of studies that build understanding of the link between home performance and health. From these complementary reports, we learn about significant research and evidence which demonstrates that efficiency retrofit projects in homes can improve indoor air quality and associated health impacts. We also learn, however, that more comprehensive (and consistent) research is needed to document both direct-occupant and wider public-health benefits from efficiency. Existing and emerging partnerships between efficiency and health industry players can support research to further demonstrate the value of efficiency programs and their co-benefits. To date, research has focused primarily on weatherization and low-income programs. Looking more broadly at efficiency investments in market-based homes will help to reveal and clarify important benefits of efficiency. Another focus that emerged from our Occupant Health Benefits paper, along with subsequent research, is that a burgeoning set of innovative, integrated efficiency and health programs and tools are making strides to illustrate the strong link between efficiency and occupant health benefits. Some are national in scope, others are at the state, county or city level. These initiatives have varying program elements, funding mechanisms, and players. Further, the extent to which the initiatives have been formally evaluated to assess their health impacts differs. E4TheFuture continues to learn about this evolving space, which holds promise not only for research opportunities on health impacts, but also for bringing innovative program designs to new areas and players. Regulated efficiency program market players (utilities, home performance contractors), in particular, can build bridges to potential new partnerships with health providers—and/or vice versa. We’ve only touched the tip of the iceberg in understanding this exciting landscape. A whole host of successful and promising ventures are under way, including national, international and multi-state efforts. Examples: the National Center for Healthy Housing (NCHH); Green & Healthy Homes Initiative (GHHI), and its partnership with the Building Performance Institute to develop the Healthy Home Evaluator Certification program; Energy Efficiency For All (EEFA) and its Network for Energy, Water, and Health in Affordable Buildings (NEWHAB) initiative; Health Care Without Harm; NeighborWorks and its state chapters/programs; and One Touch. At the state and country/city levels, programs such as Weatherization Plus Health (WA), and Healthy Homes Initiative (VT) are notable successful/emerging models. 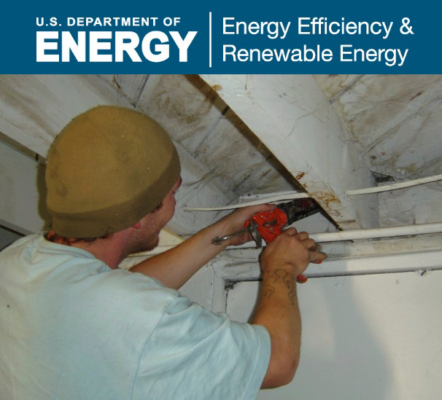 The US DOE’s “Home Rx” paper is part of its broader Health and Home Performance Initiative. Their Roadmap for Integrating Health and Home Performance plans to engage stakeholders to facilitate the home performance industry’s incorporation of healthcare into their work. Workshops are slated for conferences in January, March, and May 2017. As we consider how best to advance understanding of the value of efficiency, high on E4TheFuture’s New Year resolution list is to support building the bridge between efficiency and health. Through partnerships and coordination with leading organizations and funders, including US DOE’s initiative, we plan to focus on 1) supporting expanded research/evaluation that helps improve the methodological consistency and robustness of occupant health impacts from efficiency investments in homes; and 2) identifying existing and/or new program models that aim to integrate home performance contractor services with health programs. E4TheFuture looks forward to advancing efforts in this space. We invite and welcome you to share information or case studies of innovative programs, and/or any recent or planned research. We encourage you to participate in events that include this topic, such as the National Home Performance Conference (Nashville TN March 19-22) where I will moderate a panel on What Do We Really Know About the Health Benefits of Energy Upgrades?” as part of the HPC Indoor Air Quality & Health Track. Steve Cowell will also speak on this topic at the US DOE Better Buildings Summit on May 15-17 in Washington, DC. We hope to see you at these events!